Materials prepared at the shop-aluminum and pvc walls, doors and windows-get loaded into the truck. During grade school, Ibrahim’s friends were busy with math, science, and memorizing vocabulary—normal stuff for fifth graders. They walked to school together, kicked balls (or cans or stones or whatever else was handy) on their way home, and talked about upcoming holidays for their Yazidi community. Like kids everywhere, they were always longing for the next holiday. But by fifth grade, Ibrahim didn’t walk to school with his friends anymore. He worked on a neighbour’s potato farm and used his earnings to help his family. Later he would become a day labourer and learn how to lay concrete block from his older brother. He didn’t talk about school holidays anymore—those days were over. Sometimes in life, you simply do what needs to be done. Ibrahim was always hard working and loyal. Like many men around the world, he made choices to help his family. But the choices he made as a young man, which might have seemed freeing at the time, later became a cage. Ibrahim didn’t have the education or skills he needed to get better-paying work. To his family, to his community, and in his own mind, Ibrahim was an unskilled worker who laid concrete block—nothing more. It’s difficult for men in Iraq to change careers. Once they have the responsibility of a family, there are few options to return to school, there are no internships, no second or third chances to find work they love. In Iraq you find work as a young man, either at your father’s knee or through good grades in school. You carry on with that work until you are too old to continue. For the vast majority of Iraqi men, working life is very linear. When Ibrahim and his family were displaced from their homes by ISIS, his entire life was disrupted, including his work life. You stepped into that disruption—and offered opportunity. 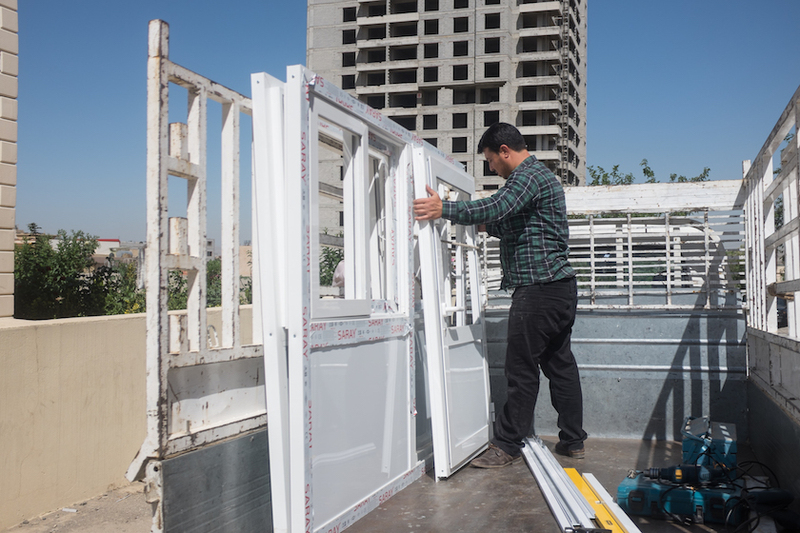 When your donations helped create a training program in work with aluminum and PVC—to build windows, doors, and kitchen cabinets like the ones shown above—Ibrahim was given the chance to have a new career. He diversified his skill set, and when he finally gets to return home, he’ll have exactly the skills that are needed to help rebuild homes and businesses destroyed by war. By partnering with people like Ibrahim, you not only provide new skills, you open up a world of possibilities. You give them the option of a building better future for themselves. And when you’ve lost so much in life, options can be hard to come by. Partner with refugees in Iraq and help them rebuild their lives.